Tuscany: Expand the World of Viticulture does just that with a collection of 12 expansions for Viticulture designed to be uncorked one at a time, Risk Legacy-style, and added to the game. There are three tiers of expansions, plus materials and rules for a solo-play experience. The designers recommend starting with the Tier 1 expansions, adding them one at a time and playing each 1 to 2 times before uncorking and adding another. Then do the same with the Tier 2 expansions, but playing them 2 to 4 times each before adding another. Eventually, you’ll be playing Viticulture with all Tier 1 and 2 expansions and can experiment with the Tier 3 expansions. The Tier 3 expansions are modular. That is only one Tier 3 expansion can be played at a time – they are not compatible with each other. When playing Tier 3 expansions you’re supposed to include all Tier 1 and 2 expansions as well. The back of the rulebook describes several variant methods of uncorking Tuscany, including a Tier-by-Tier Method in which you add all Tier 1 expansions at once, then all Tier 2 before playing the Tier 3 modules. All this talk of Tiers is pretty dry, so let’s look at the expansions themselves. Sample Mama Card from Tuscany which provides your two regular workers, plus three cards: 1 Vine, 1 Summer Visitor and 1 Wine Order. Photo courtesy of Stonemaier Games. Tier 1 includes four expansions: Mamas & Papas, Property, Patronage and Advanced Visitors. Mamas & Papas provides players with different starting resources. Tzolk’in: The Mayan Calendar also does this. It’s a nice way of encouraging players to choose different actions in the first few turns instead of everyone vying for the same thing. It can also provide players with a starting strategy. You can either deal each player one Mama and one Papa card each, or give them two of each and let them choose which Mama card and Papa card to keep. All players will begin with at least three workers: two regular workers from their Mama and one grande worker from their Papa. Mama also gives you two or three cards and maybe even a little cash to get you started, while Papa can always be counted on for cash and maybe a structure, an extra worker or a starting victory point (VP). Tuscany Property tiles. Sell fields you don’t need for quick cash! Photo courtesy of Steph Hodge. How many times have you played Viticulture and left one field fallow the entire game? I know I have. Now, with the addition of Property, you can sell off one or more of your fields for some quick cash. Property also assigns each field a different value – £5, £6, or £7 – changing the maximum value of vines you can plant on each. With Patronage, each player receives a secret goal at the beginning of the game. You can activate your Patronage card by filling it’s 5+ value wine order, which is worth 3 victory points. At game end, you’ll gain an additional 2 VP if you’ve fulfilled your secret goal. Advanced Visitors adds 15 more cards to each Visitor deck, summer and winter. Some provide new mechanisms and options, several provide a bonus for building structures of a particular cost, and others are souped-up versions of the original cards. One of the Tier 2 expansions, New Visitors, also provides additional Visitor cards. Several of the New Visitors allow you to break the normal rules in some way. For example, the Sharecropper allows you to plant a vine even if you don’t have the required structure. Some New Visitors provide new mechanisms and options. For example, the Swindler allows you to request £2 from each player; you receive 1 VP for each player who declines. The additional Visitor cards really come in handy in six-player games, when we often ran out of cards and kept recycling the same ones toward the end of the game. Tier 2 also includes an Extended Board with four seasons for worker placement, a new Wake-Up Chart, and new actions; 11 Special Workers of which you can use two each game – they cost a little more to train; and new Structures which provide a private action space, an ongoing bonus or a non-monetary residual. All of these additions look pretty exciting – and game changing! New actions on the Extended Board include being able to Sell One Wine Token for victory points – no need to have an order to fill; Trade One for One action which allows you to trade £3, 1 VP, 2 cards or a 1-value grape for any of the others; and the Influence Action which corresponds to the map of Tuscany in the bottom left corner of the board. Wow! The options are a little mind boggling, which is why the designers highly recommend that you uncork Tuscany a little at a time. And I haven’t even gotten to the Tier 3 expansions: Arboriculture, Formaggio and Mafia. I’ve played Arboriculture several times with the first edition of Viticulture. The rules have changed somewhat in Tuscany. Despite that, I don’t see any reason why you couldn’t play Arboriculture alone, without all of the Tier 1 and Tier 2 expansions. It adds a side board where you can grow apples and make tomato sauce and olive oil. When you have these new products on hand, you can upsell your wine orders to earn 1 to 3 more victory points (1 for Tomato Sauce, 2 for Olive Oil and 3 for both) when fulfilling a wine order. 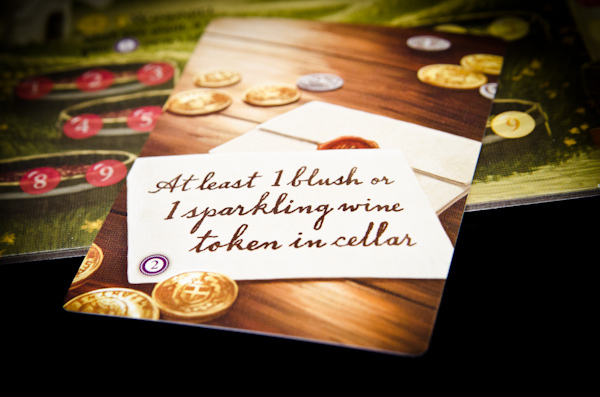 With the Extended Board, you also have the option of selling them (Sell One Wine Token action) without an order, presumably from your vineyard’s shop. You can also age wine in your cellar with the Cask action. Of course, all this extra work, your workers are bound to get a bit miffed if you don’t bribe, er reward them with some of the extra goods. Luckily they’re easily pleased with an apple a year or a little Leisure time. Make them super happy and you’ll earn some VP, too. We found the Aboriculture expansion shortened the number of rounds in the game, since players would earn more VPs per order by adding refined products. 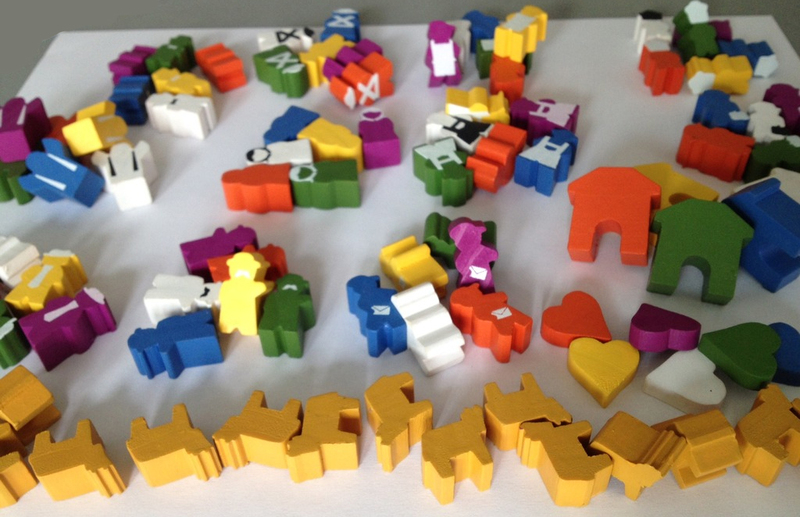 Tuscany – Special Workers and other new playing pieces. Note the cows for Formaggio across the bottom. The Formaggio module also adds a side board. This time you’re making cheese by itself or in addition to wine. The Mafia module adds cards that represent gifts for the mafia boss that took up residence nearby. Players vie to present the best gift at the end of the game earning 2 VP for the most stellar gift and losing 1 VP for the least impressive. Expect the gifts to change hands multiple times as players place their grande workers. 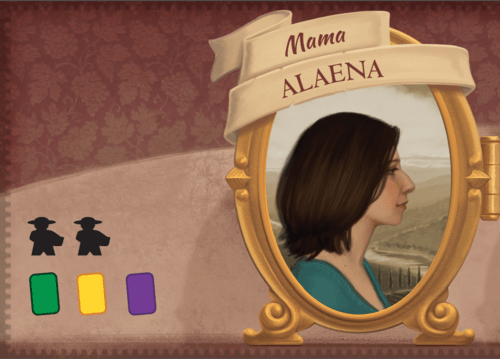 Finally, Tuscany includes a module that allows you to play solo: Viticulture Automa. 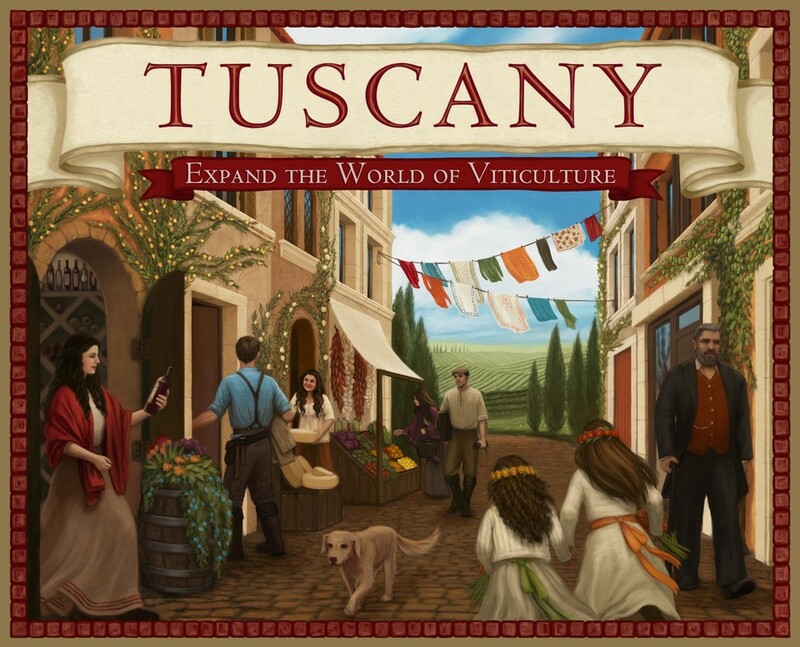 Tuscany: Expand the World of Viticulture supports 1 to 6 players ages 14 and up with a play time of 1 to 2 hours. 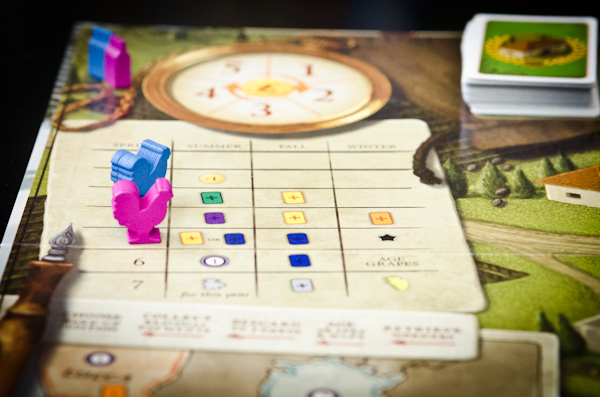 The base game, Viticulture first or second edition, is required to play. An upgrade kit is available from the publisher for first edition owners. The upgrade kit includes: 6 grande workers (1 in each player color), 30 smaller glass grape and wine tokens, stickers to add an Available Workers space to your player boards and 11 updated Visitor cards. Tuscany comes in two flavors: regular and Prima. Tuscany Prima metal Lira coins. 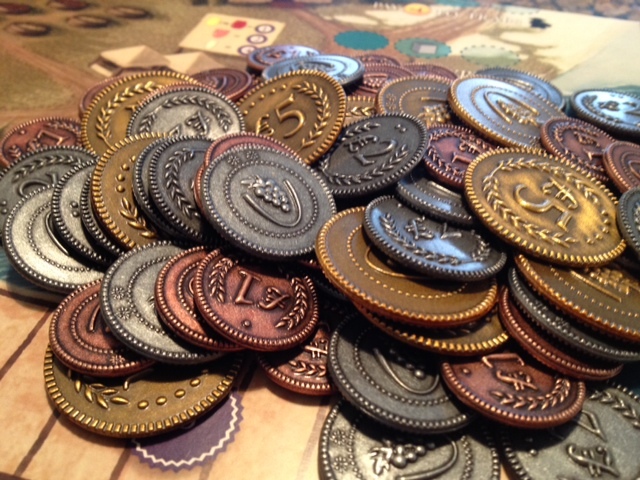 Tuscany Prima features lovely metal coins to replace the original cardboard coins in the base game; otherwise, the contents are the same. The Complete Collector’s Edition of Viticulture is a cardboard box designed to look like wood with two compartments: one filled with Viticulture Second Edition and the other with Tuscany Prima. It’s a fancy means of storing both boxes together. Tuscany is definitely not an expansion you can store inside the base game.